Cancer is a devastating ailment that continues to be a challenge for patients and the medical professionals that dedicate their lives to treating them. Due to the difficult-to-treat nature of various types of cancer, many patients and physicians are left with few to no options as it relates to treatment. If you follow news on biotechnology stocks, you’ve seen that there are several companies that are working to change this, many of which have already had incredible success, both in the clinical setting and the real-world setting. Moreover, these companies have driven incredible investor interest, creating market opportunities that are hard not to watch. Today, we’ll talk about the top 5 companies that I believe to be presenting the strongest opportunities in the oncology space. Novartis is a name that is well-known in the investing community, and for good reason. While the company focuses on several disease areas, the majority of its efforts are spent within the oncology space. In fact, the company has received marketing approval for about 25 cancer-fighting drugs to date. Of course, the value of this commercial-stage oncology portfolio is incredible, earning the company the $220 billion+ market cap that it currently enjoys. First and foremost, the growth in sales of the company’s commercially available oncology treatments has been very strong. This shows that the team behind Novartis is highly effective when it comes to the commercialization of its drugs. It’s also worth mentioning that Novartis has an incredible oncology pipeline. In fact, the company currently has approximately 30 clinical phase programs focused on the oncology space, more than half of which are in the midst of late-stage trials. Considering this, there are multiple catalysts ahead. Finally, Novartis is actively building its pipeline, both organically and through acquisitions. In fact, the company recently acquired Advanced Accelerator Applications in a deal worth $3.9 billion as well as Endocyte in a deal worth $2.1 billion. Both of these acquisitions brought high–value oncology candidates to the table. All in all, Novartis is an oncology giant that has earned its spot at the top of the list. Moreover, the value proposition only seems to be growing as the company’s work continues. Celgene is another company that has made a great name for themselves in the Oncology space. Currently, the company has eight treatments approved in the United States, with seven of these treatments being indicated for various forms of cancer. Moreover, as with Novartis, Celgene has a proven ability when it comes to commercialization of these treatments. This can be seen by the strong sales growth that the company has experienced quarter over quarter and year over year for several consecutive years. On top of that, the company has greatly expanded earnings for investors over the years. In fact, in the last four quarters alone, the company has increased earnings from $1.61 per share for the quarter ending May 4, 2018 to $2.20 per share for the quarter ending January 1, 2019. As with Novartis, Celgene has consistently produced growth in sales, leading to strong growth in revenue as well as earnings per share. With the company’s positive track record in terms of sales growth, there’s no reason to expect a plateau any time soon. Also, the company has an impressive pipeline of products under development. In fact, there are 19 clinical development programs currently taking place at the company. These development programs are centered around the treatment of three of the most difficult to treat types of cancer, and many of them have already yielded positive results. Finally, while Celgene is incredibly active in the oncology space, the company is also active among other high-value indications. Two of the highest value indications in this list include Myelofibrosis and Multiple Sclerosis. Cellectar Biosciences is a relatively small company, with a market cap of just over $10 million. However, the low market cap actually provides the basis for many bullish opinions as compared to others at its level; it is highly undervalued. Nonetheless, a feeling of undervaluation isn’t necessarily the motive for a decision to get involved in a stock. Nonetheless, there are several reasons to be excited here. Cellectar Bioscience is a clinical-stage oncology company that may be on the verge of a significant breakthrough. The company’s claim to fame is its proprietary Phospholipid Drug Conjugates, or PDCs. This proprietary technology gives the company the ability to target cancerous tumors in a way that is unmatched elsewhere, and it is the delivery method that has proven to be effective through multiple clinical trials of its flagship candidate, CLR-131. First and foremost, the company’s proprietary PDC delivery method comes with several benefits. Due to the highly targeted nature of this delivery method, radiation is proportionately delivered to tumor cells, avoiding surrounding tissue and leading to a low risk of serious adverse events (SAEs). In fact, to date, there have been no SAEs reported in any clinical trials for the treatment. In the treatment of cancer, this is unheard of. Another reason to keep tabs on Cellectar Biosciences is that the company has several catalysts ahead. In fact, the company is expecting to share a minimum of 7 clinical data readouts with investors in the year 2019 alone. This, combined with interim analysis announcements, potential presentations, and peer reviewed publications, means that catalysts are likely to come in droves ahead, leading to strong potential opportunities. Finally, the company is not targeting the easy-to-treat populations that we see with other companies on the list. Instead, their clinical trials have included patients that have already received at least 5 prior lines of therapy. With potential efficacy dropping off of a cliff after the third line of therapy, this can be a very risky move. However, in a recent clinical trial, the company showed that even in this difficult-to-treat patient population, CLR-131 was able to extend overall survival by 22 months. This is an unheard of accomplishment in the addressed patient population. Next in the line, we have Amgen. This is yet another company with a proven history in oncology. Currently, Amgen has 17 therapies that are approved for commercialization in the United States. Of these, nearly half (8) have been approved for oncology-related indications. Through the years, Amgen has shown its ability to successfully commercialize treatments, earning a market cap of more than $116 billion. However, the company’s previous success isn’t the only reason that this oncology stock is one to keep an eye on. As with many of the companies on this list, Amgen has a proven track record of solid growth in sales. As a result, the company has experienced strong revenue growth and earnings growth, providing an incredible return of value to its investors by consistently growing earnings, which have beat analyst expectations for the past four consecutive quarters. Amgen is also making smart moves with regard to targeted indications. In fact, the company currently has a pipeline that includes 35 programs, most of which are targeting serious conditions with few-to-no options for patients and the physicians treating them. As a result of this focus on serious conditions with high medical need, the company has earned various Orphan Drug Designations and is well positioned to take the lion’s share of various markets as these pipeline products make their way to commercialization. Finally, Amgen is on an acquisition hunt at the moment. As generic competition starts to encroach on sales, the company is working to increase value for investors by acquiring others that have products with the potential to drive strong revenue increases. When companies of this size make proactive moves to combat potentially declining sales, we generally see strong growth in value in the long run. Finally, we have Exelixis. With a market cap of just over $7 billion, this is an up-and-coming oncology company that could quickly grow to a valuation like what we’ve see with Celgene and Novartis. The company’s flagship product is known as Cabometyx. The treatment was designed as a second-line option for renal cell carcinoma, also known as RCC. In both clinical and real-world settings, Cabometyx has proven to be effective, improving objective response rates, progression free survival rates, and overall survival rates. First and foremost, Cabometyx is a blockbuster drug. In 2018, the treatment generated $619 million in sales, showing an impressive 77% year–over–year increase. Moreover, the FDA recently expanded the label of the drug to include second-line advanced hepatocellular carcinoma (HCC) as an approved indication. This could lead to strong sales growth in the year ahead as the commercial rollout for this indication hits full swing. Also, Exelixis isn’t planning on putting a halt to innovation any time soon. In fact, the company recently submitted several Investigational New Drug (IND) applications to the FDA. The ultimate goal is to develop XL092 as an option for various types of cancer. Although XL092 is currently in the early stages of development, the treatment has shown promising preclinical data and could be yet another blockbuster down the line. Finally, according to Finviz, institutional investor interest is incredibly high, with institutional investors currently holding well over 70% of shares. The oncology space is an exciting one to follow. 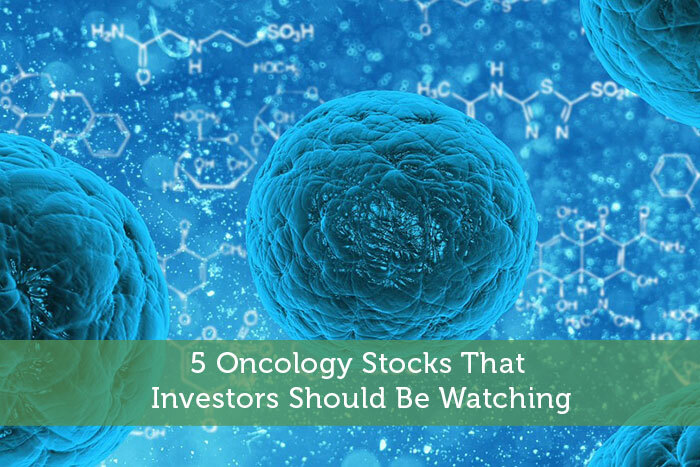 With a massive market opportunity in any cancer indication, and innovation taking place at a rapid rate, investor interest in the space is climbing and will likely continue to do so. With the advancements the companies above have made and are continuing to make in the space, these stocks are hard to ignore.